There are two primary life cycle stages of Bd, one sessile and one motile. The stationary form is basically just a sexual structure, the zoosporangium, from which the motile form emerges. The motile form, the zoospore, has a single flagellum that allows it to move short distances (1-2 cm) with the help of chemotaxis. In order to digest amphibian cells and use the skin as a nutrient source, Bd uses esterases and proteolytic enzymes. Upon reaching the host, the zoospore forms a cyst beneath the skin before beginning its reproductive cycle. 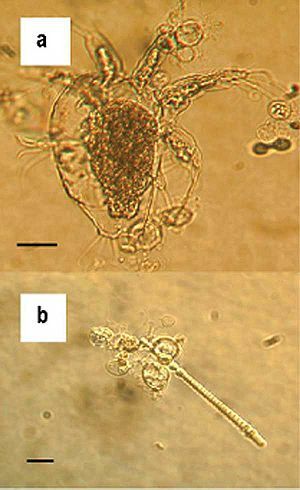 Reinfection can occur within the host if the encysted zoospores develop into zoosporangia and release more zoospores. Cause of death after infection is cardiac arrest. The issue with this fungus seems to be one of many cases where human intervention has increased the spread. There are anti-fungals that are successful in captive populations but no good method for wild amphibian treatment. (Amphibian Ark). There has been some resistance within previously susceptible species, but will any evolution or mutations be rapid enough to prevent extinction of many amphibians? 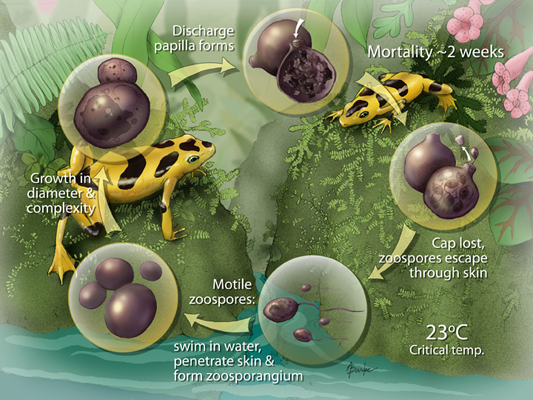 For information on yet another disease affecting amphibian populations, check out “From chytrid to ranavirus: Another disease is devastating frog populations” by Scientific American.